From left to right: lone star tick, deer tick, American dog tick. Ticks are generally despised by most people, perhaps because of their intimately vampiric lifestyle or their potential to transmit disease-causing pathogens. When ticks become a nuisance in patios and backyards or even in buildings, pest management professionals (PMPs) may be called to deal with the problem. 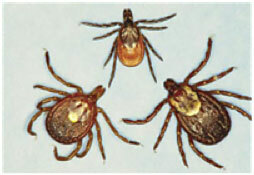 Three female adult ticks commonly found in the eastern and Midwestern United States. From left to right: lone star tick, deer tick, American dog tick. Ticks are not insects but arachnids, grouped in the same subclass as mites (Acari). Just like mites, ticks have four life stages (egg, larva, nymph and adult), and larvae have three pairs of legs while nymphs and adults have four pairs, but ticks are much larger than mites. Ticks have two body parts: the idiosoma, the main body part that includes the organs and legs, and the capitulum, or mouthparts. In most tick species, all life stages bloodfeed, and a blood meal is required for the female to produce an egg batch. There are soft ticks and hard ticks. Hard ticks get their name because of the shield-like structure (scutum) on the backside of the idiosoma. The scutum entirely covers the back of the immature stages and the adult male, while on females it covers the front portion of the back. Soft ticks do not have a scutum. A hard tick’s mouthparts can be seen projecting forward, but the soft tick’s mouthparts are partially or completely hidden underneath the body. Tick life cycles are classified by whether molting occurs on the host after feeding. If molting through all stages occurs on the same individual host, the tick is a one-host tick. In the United States, most hard ticks are three-host ticks whereby each stage feeds, drops off, and molts in the environment, requiring a different individual host for each stage. Soft ticks are usually termed as “multi-host ticks” due to numerous feedings as nymphs or adults. Life cycle length varies among species— and even within species — because of climate and other factors. Ticks spend the majority of their lives in the environment. Off-host ticks depend on refuges that provide suitable and stable ranges in temperature and humidity, such as under leaves or rocks, inside rodent burrows or within crevices. The engorged female tick also seeks these refuges to lay her batch of eggs. Some soft tick females can oviposit several times, interspersing each event with a blood meal. But most hard tick females engorge once, drop off the host, oviposit and die. Most ticks are usually active in the spring and summer months in the northern United States, but in the warmer parts of the country, some species may be active all year. When unfed ticks seek a host, the behavior is called questing. The tick will climb onto a vertical surface, such as a blade of grass, extend its first pair of legs and wait for a host to brush past. Once on a host, the tick finds a suitable site to attach and feed. For most of the commonly encountered tick species, tick larvae feed on small vertebrates (rodents, birds) and adults seek medium to large-sized vertebrates (ungulates). Some soft ticks also quest, but most use a feed-and-hide behavior similar to that used by bed bugs and kissing bugs. Most soft ticks are associated with arid habitats or roosting animals and this feeding strategy may be more advantageous in these situations. The ticks hide in crevices, cracks and other protected nooks in the host’s dwelling. While the host rests, the ticks emerge, crawl onto the host, quickly feed and return to their shelter. Though ticks mostly cause problems outdoors, there are a few tick species that can live in buildings — the common thread among these ticks is that their hosts also inhabit the structure. The bat tick (Carios kelleyi) is a soft tick associated with bats throughout parts of North America. The ticks hide in cracks and crevices and feed intermittently on roosting bats within caves as well as in human-built structures. These ticks become a nuisance when their hosts leave or are removed from a house, leaving hungry ticks to wander into other parts of the building in search of a blood meal. A similar problem is observed with Ornithodoros hermsi, a soft tick found in the higher elevations of western North America that feeds on rodents and birds. When the tick hosts leave or die within cabins or similar structures, O. hermsi will feed on people. Another tick that can inhabit buildings is the brown dog tick (Rhipicephalus sanguineus, a.k.a. the kennel tick). This three-host hard tick is a nuisance to humans and can transmit serious diseases to its principal host, the dog. Once established, it can be a pest of houses, apartments, kennels, veterinary clinics, zoos and other buildings. Eggs and engorged ticks can be found in cracks and crevices in masonry, building walls or ceilings. Questing ticks are found along baseboards, window casings and curtains, bookcases, inside upholstered furniture and under edges of rugs, draperies and carpeting. If a host is not found, these ticks can survive a long time without a meal — unfed adults can survive about 200 days without a host. Most tick infestation problems that a PMP will need to deal with will be in backyards, acreages and other outdoor areas. As long as ticks can survive the local climate and find shelter and hosts, they can establish in the peridomestic habitat. The spinose ear tick (Otobius megnini) is a one-host soft tick found in some parts of the southern and western United States. It primarily infests the external ear canal of wild and domesticated hoofstock, but can infest humans, cats and dogs as well. Off-host stages are usually found under rocks and other refuges. Another soft tick, the pajaroello tick (Ornithodoros coriaceus), is found in hillside scrub oak habitats from Mexico to southern Oregon. The tick is associated with the bedding areas of deer, cattle and other large mammals, and will feed on humans that rest near these areas. The American dog tick (Dermacentor variabilis) is found throughout most the United States, except for some areas in the Rocky Mountain region. This hard tick is commonly encountered along roads, paths, trails, in forests and on grass and other low vegetation. Its close relative, the Rocky Mountain wood tick (Dermacentor andersoni), is found in mountainous areas of the western United Sates. The deer tick or blacklegged tick (Ixodes scapularis) is found throughout eastern and midwestern U.S. forests and woodlots. It may well be the most commonly encountered tick in some parts of the northeast and upper Midwest. Adults principally feed on deer, and local tick density is correlated with deer numbers. The tick is the vector for the agents that cause Lyme disease, human granulocytic anaplasmosis and human babesiosis. The western blacklegged tick (Ixodes pacificus) is the primary vector of Lyme disease and human granulocytic anaplasmosis in the West Coast. The lone star tick (Amblyomma americanum) is also a forest-associated tick species. This tick is common in the Gulf Coast states. Its distribution stretches from the Gulf Coast and north along the eastern seaboard and the southern portion of the Midwest. The tick has a wide host range, and once locally established, it can become abundant. This tick can transmit the agents of tularemia, Rocky Mountain spotted fever, human monocytic ehrlichiosis, and Southern-tick-associated-rash-illness (STARI), which has similar initial clinical signs as Lyme disease. Its relative, the Gulf Coast tick (Amblyomma maculatum), is found in the Gulf Coast, Oklahoma and southeastern Kansas. Adult ticks principally feed on cattle, but may attach to humans and dogs. Tick avoidance and control require an integrated approach in which ticks are considered along with their requirements for life — hosts and shelter. If the goal is to reduce an individual’s risk of being bitten, several measures can be taken. Avoid tick-infested areas, particularly during those times of the year when ticks are most active. Consider creating barriers, both physical and chemical, against tick attachment. Encouraging the use of long-sleeved shirts and pants, as well as using DEET, picaridin, IR3535 or treating clothes with permethrin, would fall into this barrier-creating strategy. PMPs are most likely to be consulted when ticks are a problem within or around homes, businesses and other facilities. Tick control at this level begins by identifying where the problem is occurring, whether inside a structure or outdoors. Controlling indoor tick problems focuses on preventing ticks from feeding on hosts and killing off-host ticks to prevent future re-infestation. To get rid of bat ticks, for example, a residual insecticide should be used in tick hiding places, and bats need to be professionally removed and prevented from entering the affected building in the future. Likewise, control of brown dog ticks requires that dogs no longer be a meal for ticks by using canine acaricidal products, coupled with residual acaricide applications that eliminate off-host ticks. permethrin, tau-fluvalinate, tetramethrin, phenothrin, tralomethrin). Control of outdoor ticks is typically more difficult and expensive than dealing with indoor infestations. Complete eradication is likely not feasible, but a substantial reduction is a realistic goal. In the outdoor environment, area-wide applications of pyrethrins and pyrethroids (bifenthrin, cyfluthrin, deltamethrin, esfenvalerate, lambda-cyhalothrin, permethrin, tralomethrin) can be used. Regrettably, because of DDT’s history, many in the general public perceive area-wide applications with insecticides to pose a threat to their health and the environment, even in the face of potentially acquiring a tick-borne disease. Pyrethrins may be coupled with piperonyl butoxide (PBO) and with either insecticidal soap or diatomaceous earth to increase their efficacy and reduce non-target toxicity. If used by themselves, biological agents (parasitoid wasps, bacterial and fungal agents, tick predators) may decrease tick numbers, but not to a level that is likely amenable to the client. Combining several acaricidal, biological, host-based and environmental strategies may prove the difference in reducing tick numbers in the outdoor habitat.